A growing number of families are choosing to invest in loft conversions as a way to expand their home without having to move house or shell out for a far more expensive extension. Loft conversions are a great way to get an extra bedroom for the kids, an extra study to give you some peace while you work from home, or some more space for a den or game room. 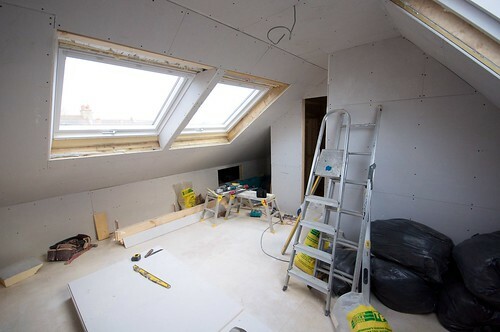 However, once the loft conversion is done and the builders have cleared out their building supplies, the clean and empty new rooms can look rather drab and boring. How can you accent those Velux windows nicely? What colour should you paint the room? How can you maximise the amount of free space you have without leaving the place looking clinically clean? If your new loft is intended to be used as a bedroom, then the cosy country look is a great option, and it’s fairly easy to pull off too, especially if you have some exposed beams left following the loft conversion. Invest in some small chequered curtains to frame your Velux windows, and make generous use of natural materials for everything from the bed and bookcase to the rugs and throws. Try to stick to light colours, especially blues and whites, so that the room looks nice and bright and airy. If you’re planning on turning one of the rooms into a study, then why not aim for a more modern appearance? Try to make your new loft look like it belongs in a big city apartment. Instead of linen and pine, opt for clean, sleek lines and plenty of metal and glossy surfaces. This will ensure that you still retain the illusion of having lots of space, but will give the room an entirely different flavour to a country-style bedroom. Some young children struggle to adapt to “moving house” even if all they’re doing is moving from a downstairs shared bedroom to a brand new room of their own in the loft. To make the transition easier, involve them in the process from day one. Explain to them that all of those building supplies in the back yard are being used to build their new bedroom. Have them draw out plans for what they want it to look like, and take them shopping when you go to get some decorating supplies. Naturally, you may not want to let them go wild spending a fortune on action hero wallpaper and bed linen, especially if they change their favourite TV show every other week, however that doesn’t mean that they can’t make the room their own. Involving your kids in picking out the colour of the carpet and the design of the wallpaper for your new loft conversion will make the process of moving to a new sleeping area go far more smoothly, and you never know, they may come up with some great design ideas, saving you from endless hours of strolling up and down B&Q searching for inspiration. This article was written by Crispin Jones on behalf of Ashbrook Roofing, suppliers of velux windows and building supplies. Go to their website for more information on velux windows or building supplies.